Last year, Whitworth University graduated nearly 60 students from its undergraduate teacher preparation program. Whitworth's Continuing Studies Evening Teacher Certification program and Master in Teaching program – tailored especially for people seeking to make a career shift into teaching – also produce about 60 teachers per year. The university is committed to ensuring that those teachers are prepared according to accepted national standards of excellence and qualified to teach in today's classrooms, and has once again received a seal of approval from the most rigorous and recognized accreditation for teacher-education programs in the U.S. What's more, the university met all standards with no areas for improvement cited, thus receiving a very rare perfect score. Studies show that teacher quality is the most important factor in P-12 student achievement, and professional accreditation is one way to ensure that schools are graduating high-quality teachers who enter the classroom ready to help children learn. For 46 years and counting, Whitworth has been proving its commitment to meeting those performance-oriented standards through continually achieving accreditation from the National Council for the Accreditation of Teacher Education (NCATE). After an extensive review and a site visit to Whitworth's campus last spring, NCATE announced this week that Whitworth's School of Education has again met its accreditation standards, without any areas for improvement identified. "Voluntary national accreditation is important to us because it involves regular internal review of our programs, external review by a national team of experts, and impartial information about what we are doing well and where we can improve," says Dennis Sterner, dean of the Whitworth School of Education. "These reviews are all based on high national standards for the preparation of teachers, school counselors and school administrators." Sterner continues, "The School of Education at Whitworth is committed to preparing exceptional teachers, counselors and administrators. Accreditation is an important component of accountability; however, we are also regularly reviewed by the Washington Professional Educator Standards Board, and we do extensive self-evaluation including follow-up studies of our graduates." 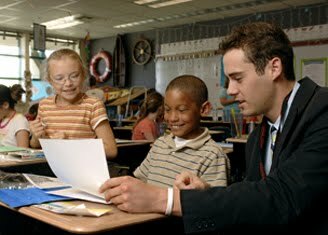 Particular strengths of Whitworth's teacher-education program as cited by NCATE include cultural competency; clearly defined benchmark assessments for students; outstanding faculty who are recognized by their peers and have an in-depth understanding of their content areas; and respected administrative leaders who enact effective processes for continuous improvement. In addition, NCATE praised Whitworth's implementation of unique cultural and diverse field experiences. For instance, a course at the secondary and elementary levels requires students to spend time working with P-12 students in a culturally diverse setting, either through study abroad in places such as Tanzania and Taiwan or in diverse cities in the U.S., through an independent field immersion or through teaching locally in a school that has been identified as diverse. Whitworth's practice of sending faculty around the state to follow up in person with first-year teachers was also commended. A particular distinctive of Whitworth's School of Education is its Center for Gifted Education & Professional Development, which is the only one of its kind in Washington state. Whitworth established the Center for Gifted Education & Professional Development in 1979, in response to the growing need for leadership on the east side of Washington state to facilitate the distribution of materials and to provide services for the exceptionally able learner. Whitworth's center supports and develops policies and practices that encourage and respond to the diverse expressions of gifts and talents in children and youth from all cultures, racial and ethnic backgrounds, and socioeconomic groups. To this end, the center supports and engages in research and development, staff development, advocacy, and communication and collaboration with other organizations and agencies that strive to improve the quality of education for all students. In addition, the center's extensive library of current and classic gifted materials, including periodicals and major texts in the field, is a valuable resource for teachers in the areas of curriculum planning, classroom management, learning-styles realization, and lesson planning for gifted children in all types of programs. The center is an important part of Whitworth School of Education, the mission of which is to prepare educators of mind and heart who are scholars, community members, effective practitioners, visionary leaders, and guardians who advocate for children and youth. The School of Education provides its students opportunities to integrate theory and practice in diverse settings through the study of established and emerging content, as well as through pedagogical and professional knowledge. Whitworth prepares educators to have a positive impact on the learning and development of those they are called to serve. NCATE currently accredits 623 institutions, which produce two-thirds of the nation's new teacher graduates each year. NCATE-accredited schools must meet rigorous standards set by the profession and members of the public. Teacher candidates must have in-depth knowledge of the subject matter that they plan to teach as well as the skills necessary to convey it. The college or university must carefully assess this knowledge and skill to determine that candidates may graduate. The institution must have partnerships with P-12 schools that enable candidates to develop the skills necessary to help students learn. Candidates must be prepared to understand and work with diverse student populations, and college and university faculty must model effective teaching practices. And the school, college, or department of education must have the resources, including information technology resources, necessary to prepare candidates to meet new standards. NCATE revises its standards every five years to incorporate best practices and research in order to ensure that the standards reflect a consensus about what is important in teacher preparation today. In the past decade, NCATE has moved from an accreditation system that focused on curriculum and what teacher candidates were offered, to a data-driven performance-based system dedicated to determining what candidates know and are able to do. The new system expects teacher-preparation institutions to provide compelling evidence of candidate knowledge and skill in the classroom. Multiple types of performance assessment are expected throughout the program of study. Candidate qualifications are assessed upon entry, and candidate competence is assessed throughout the program as well as prior to student teaching/internship work, and before completion of the program. Meeting NCATE accreditation standards also helps institutions prepare new teachers for the advent of more rigorous licensing standards in many states. NCATE accreditation standards incorporate the model state licensing principles developed by a task force of the Council of Chief State School Officers. For more information about Whitworth University's teacher-education program, visit www.whitworth.edu/education. More information about NCATE is available at http://www.ncate.org/. Dennis Sterner, dean, School of Education, Whitworth University, (509) 777-4411 or dsterner@whitworth.edu.